This bunny used to be named Bumper. 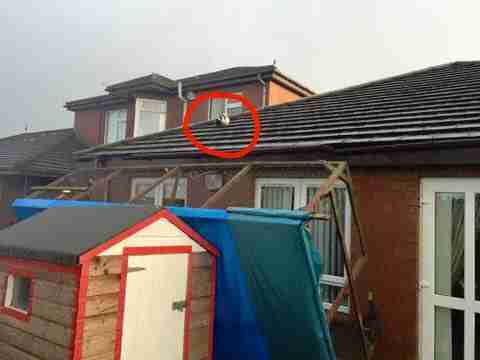 But that was before she was blown onto a roof in Omagh, Ireland, by Storm Gertrude this week. The little bun was rescued by firefighters Friday morning after her hutch was blown into the air. The hutch was smashed when it collided with Bumper's owners' house, but Bumper somehow managed to land in a slightly safer spot: the roof. When Bumper's owners called the fire department for help, they responded quickly despite Roof Bunnies not being their usual line of work. "It's not the kind of thing we would usually go to," District Commander of Omagh Fire Station told BT.com. "But because of the conditions - it was so windy - we were scared that if we didn't go out and deal with this, a member of the public would try to go up and end up getting injured or worse." After luring Bumper down with a reach pole, the firefighters delivered her back to her family. Bumper, for her part, couldn't believe her luck. Bumper's new name is Gertrude. Think of this as further proof that bunnies should definitely be kept indoors.